The camp day starts at 8:30 a.m. and ends at 4 p.m. (1:15 for half day), and each group follows a weekly block schedule. 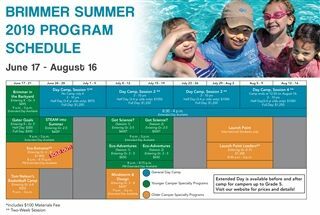 Program periods run from 30 to 60 minutes, depending on the age of the campers. Each group moves as one unit from activity to activity with their counselors. The activities offered include: archery, arts & crafts, ceramics, drama, music, nature, outdoor games, sports, and swimming. Every morning at 8:30 a.m. camp begins with Cove—a half-hour period during which the entire camp community gathers on the soccer field to start off the day. We sing! We Dance! We celebrate birthdays and swimming milestones, watch skits and get energized for the day! The first Friday of every session, after-lunch, all Full-Day campers and staff gather on the field for the All-Camp Event. Activity Specialists create and organize such crowd pleasers as Camp Olympics, Gold Rush, Banana Bonanza, and Superstar Challenges. The goal of All-Camp Events is to engender team spirit and camaraderie. Campers enrolled in the Full-Day program gather in the theatre on the last Friday of each session, from 3:00-4:00 p.m. to highlight and show off what they have worked on at camp. Campers demonstrate what they have learned in music, the project they made in arts and crafts or nature, or a performance they have been working on in drama. Parents and friends are welcome to attend! Each week we introduce a new theme. Campers and staff are encouraged to incorporate themes into every aspect of camp life—from morning Coves to activity periods, All-Camp Events, and Friday Assemblies. At Brimmer and May, costume days, song challenges, special stories, and silly games abound! These are examples from some past theme weeks: Disney Week, Go Green Week, Safari Week, Construction Zone Week, Red, White & Blue Week, Under the Sea Week, Carnival Week, and Olympics Week. During morning and afternoon Extended Day programs campers are involved in quiet activities in our lego room, our game room, or they participate in free play on our playground. A light snack is provided during the afternoon Extended Day program. Please note that the deadline for Extended Day enrollment is May 1.